Thermistor sensor applications often require a particular type of thermistor temperature sensor depending on whether you are seeking to measure, control, or compensate temperature. This page is dedicated to providing you with the information and resources you need to broaden your knowledge base, thus providing answers to your questions as well. The Immersion Stem Effect and How to Eliminate it for Good! NTC thermistor temperature sensors are used in a variety of thermistor senor applications to help regulate, monitor, control, and compensate temperature. Below are some interesting articles that give you insight to some of the applications that our products have successfully been used in. If your thermistor sensor applications involve either temperature measurement, and or control, these are great articles to read. The challenge of obtaining an accurate resistance measurement is to alleviate the loading effect of the circuit by the meter. Using a Wheatstone Bridge solves that problem. Read the full article. FYI: What is a Wheatstone Bridge. A Wheatstone Bridge is a network of four resistances an Electromotive Force (emf) source and a galvanometer connected such that when the four resistances are matched, the galvanometer will show a zero deflection. When high accuracy and long-term stability is your priority, Ametherm’s DG series of glass-encapsulated NTC thermistors are the right choice. The last thing you want to do if you need to replace a thermistor is to re-calibrate the replacement if you don’t have to.These thermistors are interchangeable so there is no need to re-calibrate, which saves time. Thermistors used to Measure Temperature in Lake Tahoe – Temperature Measurement. Learn why the scientists at the Tahoe Environmental Research Center rely on NTC thermistors to measure the changing temperature of the lake. Global warming has caused the lake temperature to rise, which will adversely impact the echo system of the lake and its inhabitants. Read the full story. Because NTC thermistors play a crucial role in temperature detection, they offer a better way to detect fire. They quickly react to a change in temperature; not the detection of smoke or smoldering fire to alert you to danger. This article breaks down thermal time constant and its relationship to NTC thermistors. It shows you how to measure thermal time constant and walks you through an experiment used to demonstrate one particular method of measurement. Learn how to setup a bridge network in thermistor sensor applications for a temperature control or compensation circuit. ACCU-CURVE™ thermistors are used for high-accuracy temperature sensing, control, and compensation in medical, industrial, and automotive applications. They offer long-term stability and reliability over a broad temperature range. 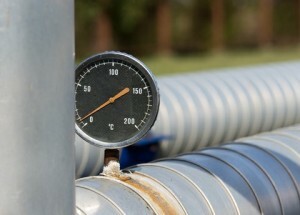 Temperature compensation is a common problem among coils, or solenoids. These metals exhibit a positive temperature coefficient with rising temperature. Learn how a fixed parallel resistor is used to bring the temperature coefficient down to a usable limit. NTC thermistors are expanding into new and unknown territories where they function very well. This year, EVGA; an American computer hardware company, redesigned its leading cooler fan to better monitor and cool power components with the added use of NTC thermistors. Read more. Understanding the math that’s involved in the thermistor selection process is crucial to selecting the right thermistor for the job at hand. Explains why the beta value, although often used, is not as accurate as using the Steinhart and Hart equation. The Steinhart-Hart equation uses three temperatures over a given range. This article provides you with an equation you can use to calculate a thermistor’s temperature coefficient. The temperature coefficient is the change that occurs in the resistance with a change in temperature. A useful and frequent customer example is provided. This equation is arguably the best to use when determining the resistance temperature relationship of NTC thermistors and NTC probe assemblies, given that the equation uses three temperatures. This article tells you which equation to use in your application. Curves are available in PDF format for A, B, C, G, H, I, L, M. Click on a particular curve to view its chart and information. All curve charts are downloadable. Questions? Check here to get answers!